OK. So you want to know all about Albert Pike and the Knights of the Golden Circle, right? Well, here's the way you do it. 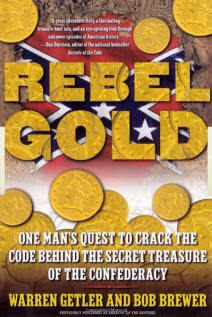 You go buy the book by Getler and Brewer titled Rebel Gold (now Shadow of the Sentinel). That's it. It's the beginning and the end of the fantasy. Nobody else has ever tied Pike into this before that we can determine - and the book only does it through fanciful memories of a teenager interpreted in light of what he THINKS he knows but with no substantiation whatsoever. Being a U.S. Navy Veteran like Bob Brewer, I'm reluctant to speak ill of a shipmate. However, one of the things that ALL U.S. sailors learn, always in the first few hours of their military service, is the maxim "Ask the Chief". It's based on the long-time tradition that a Chief Petty Officer 'knows the ropes' (a nautical term from sailing ship days!) and can provide sage advice and guidance to help a seaman avoid dumb mistakes. This advice has been given to sea service members for over a century and is well-founded. So here's what this Senior Chief Petty Officer has to say about aviator Lieutenant Commander Brewer's flights of fantasy: "This stinks like ten year old bilge water!" Amazon Link If you don't want to spend a few bucks lining the pocket of a treasurer-hunter or, more likely, a supposed 'investigative reporter' trying to sell this to anyone with a buck, you might be content with the facts that we've presented here. Now to be fair, if I were a treasurer hunter seeking to justify to my wife and family or even to my own brain why I did what I did, I'd be praising Rebel Gold to the hilt. As far as using it as a basis for understanding history, though, I'd have to go back to the bilge water comparison - and the attempts to make this tale real are like going after that bucket of steam sailors are often sent to retrieve. Those who love action fiction might be enthralled by the stories of train robbers, buried gold, huge national conspiracies to rebuild the Confederacy while saving slavery and more, all told with a quickly increasing pulse of the hunt for treasure. A former financial reporter who has since spent, it appears, a considerable amount of time hoping this work (with him listed as the lead author) will be a blockbuster hit, breathlessly tells the story after a few pro-forma disclaimers at the outset. (Mr. Getler, it should be noted, is listed on the book jacket as an "investigative journalist in Washington, D.C." after having been a New York based financial reporter for The Wall Street Journal. One wonders who's paying him a salary for his so-called investigating. Both his publisher Simon & Schuster as well as that locator of every scrap of information available (Google!) fail to provide any further light on this. It should also be mentioned that the book was republished with the title "Shadow of the Sentinel". It's still all hogwash in this reviewer's opinion! Here's where the story begins: the KGC - Knights of the Golden Circle are a little-known group that was formed in the northern, mid-west of the United States as the Civil War was drawing to a close. It was their hope that the battle to maintain slavery could be continued even as the inevitability of the lost cause was, to most, patently obvious. Created and maintained with utter secrecy (after all, who really wanted to get hung after the war was over? ), it's a little-known footnote to history, never having accomplished anything and having faded away in time - except in the mind of one person who convinced a second and together they've gotten a book out of it all. Yep. It MIGHT HAVE BEEN.... Do you remember that line about 'If wishes were fishes....'??? Or, perhaps more apropos, the one about "assumptions"??? Oh, there's lots of it but it all leads back to Mr. Brewer's ASSUMPTIONS based on what he THINKS MIGHT have happened, buttressed by his personal observations but unfounded by any legitimate historian or history. It is, as we said at the start, bilge water! Bottom line: as a stimulus for treasurer hunters, you'll be tickled at his finding a 1903 jar filled with gold and silver and maybe you could convince your wife - as he did - that all of the bizarre behavior could really turn into something (although we don't think you'll need an elaborate ruse involving the century-dead Albert Pike but what the heck....). As to historical proof, this book is so far lacking that it's embarrassing. Just one example: they've written about the many trips made by Pike in the period from 1880 through 1884 suggesting that this may have been to shore up support in the Knights of the Golden Circle and to help bury their money but they've totally ignored what Pike actually accomplished on those trips and why they were undertaken. (Pike was essentially penniless and in 1879-1881 he appealed to the Scottish Rite for money. They allowed him $1,800 for the present, one past, and all future years of service as well as the right to live rent free in their building. Wouldn't you think he'd want to do SOMETHING to prove that he was worth the expense? Oh, and what's more, when he went on these trips, he was creating Scottish Rite bodies at every stop and claiming for the Southern Jurisdiction all of the newly opened territory thereby limiting the Northern Jurisdiction to an area essentially north of the Mason-Dixon line and east of the Mississippi River. A mixture of fund-raising, power expansion, and proving one's self - which shouldn't be hard for ANYONE to understand unless they're trying to justify why they're spending their lives hunting treasure in snake-filled woods and thinking that it somehow tied in with the Masons! Here are some of the books referenced less the standards like Mackey's Encyclopedia on the shelf above where these books were placed for the photo just so you know that we didn't pull this stuff out of a hat. We've done the research, checked the Rebel Gold references, and found it sadly lacking! (We should mention too that they've bought into the Oak Island Treasure stuff as well as the fantasies of Baigent & Leigh. You won't get many clues that come directly from Dan Brown, but I did get one that was nearly as good. As I scamptere down the twisted trails of history, I encountered a larger-than-life American of the nineteenth century named Albert Pike. One day, I got an out-of-the-blue call from an author, Warren Getler, mentioning a book that he had written, Shadow of the Sentinel. 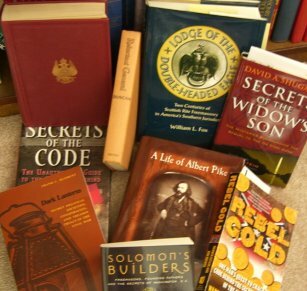 (masonicinfocom note: this is the title under which Rebel Gold was originally published.) It's about Civil War-era treasure that may have been buried in Arkansas and farther west, perhaps in Arizona. But it also brings up historical figures such as Jesse James and the very same Albert Pike. Getler recounted a little vignette. It seems that he and Dan Brown attended a publishing luncheon together in the spring of 2003, since both were in the final stages of releasing their books. The two chatted and when Dan Brown inquired about Getler's book and heard a little about it, up came the name of Albert Pike. According to Getler, Brown "blanched" and said, "I don't think I should talk about this further with you, because my next book is going to be about Albert Pike!" Truth or fiction? We'll probably never know - but it's always good when someone can tell stories that have about a 1% chance of being refuted by the actual participant. And now that Mr. Brown's book has been released, the likelihood of this story being true is just about as good as the fantasy these authors want you to believe. Apparently Mr. Getler read somewhere that everyone should be on Twitter. Under the name getler99, he posted a total of nine times between early morning July 7, 2009 and afternoon July 10. That was it and nothing since (through 29 May 2010). All his 13 followers as of 11 September 2009 must have been very disappointed. So much for THAT kind of marketing. On September 10, 2009 (in advance of the planned release of The Lost Symbol by Dan Brown), the shilling of this bizarre tale was in full bloom. The Washington Post reported "Old Town Trolley Tours is mulling the launch of a Secret Symbols tour of D.C., based on a concept and 50-page script drafted by Washington writer Warren Getler." (Link) So now a fellow who tells the tale concocted by a treasurer hunter who thinks things said and done by his long-deceased grandfather is going to tell you all about the secret symbolism of Washington. Yeah.... Does anyone want to buy my script for how to spot unidentified flying objects when they're hidden in the sky? Look! Up there! See it? 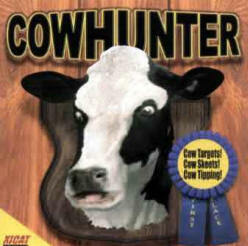 Created 12 September 2009 and updated while laughing on 19 September 2009. Full Disclosure: This book was purchased by me from Amazon using my own funds. I received no inducements to provide this review.